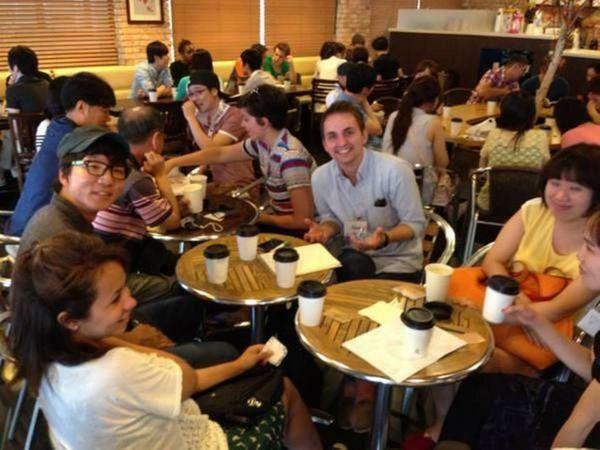 WEEKLY(held everyday) Language Exchange Cafe in Hyehwa, Hongdae and Gangnam. 80+ people from various nationalities attend each meeting. The whole coffee shops are booked for us to use. 매주(거의 매일 열립니다) 언어 교환 모임 – 혜화, 홍대와 강남 Coffee shop에서 모여 서로의 언어를 연습합니다. 파티에 비해서 언어 연습을 주 목적으로 합니다. 하지만 친구 사귀기에도 좋아요. 특히 술 안 좋아하시는/드시는 분들에게 추천합니다. THURSDAY Language Exchange Cafe in HONGDAE! What kind of language meetings do you host? / 주최하는 언어 교환 모임은 어떤 종류인가요? We organize language exchange meetings every day for Koreans and expats to practice languages together in a fun and friendly environment. The whole coffee shops are booked for us to use. It’s all about meeting new people and making international friends over coffee. 한국인들과 외국인들이 매일 모여서 즐겁고 친근한 분위기 속에서 언어 교환을 할 수 있는 모임을 주최합니다. 커피숍 전체가 우리 모임을 위해서 사용됩니다. 새로운 사람들을 만나서 커피를 마시며 외국인 친구들도 사귀는 모임이에요. Is there a structure to the meetings? / 모임은 어떤식으로 운영 되나요? People receive a nametag with stamps of the languages they know so they can meet other people interested in the same languages easily. People have casual conversations, study languages together, bring books, play games, etc. In the evening, many people also have dinner and drinks together. 입장하실 때 명찰을 받는데, 그 위에 본인들이 관심있는 언어를 표시하는 스탬프를 찍습니다. 그러면 서로 상대방이 어떤 언어에 관심 있는지 쉽게 알 수가 있지요. 편하게 일상적인 대화를 주고 받거나, 함께 언어를 공부하거나, 책이나 게임을 가지고 와서 함께 즐기기도 합니다. 저녁에는 참가자들끼리 모여서 저녁도 함께 하고, 술도 마시고 합니다. How many people attend each meeting? / 매번 모임에 얼마나 많은 인원들이 모이나요? 100+ people (Gangnam) and 50+ people (Hongdae) attend each meeting. Countries represented include Korea, Japan, China, USA, Canada, England, France, Spain, Russia, and many more. 강남에는 100명 이상, 홍대에는 50명 이상이 모입니다. 한국, 일본, 중국, 미국, 캐나다, 영국, 프랑스, 스페인, 러시아, 등등 여러 국가 사람들이 모입니다. Which age groups attend the meetings? / 참가자들 연령대는 어떻게 되나요? Most people are in their 20s and 30s. Some teenagers and some people in their 40s also attend. 20대와 30대가 주를 이룹니다. 하지만 10대들도(술집이 아니니 미성년자도 참가 가능합니다.) 오고, 40대 이상도 참가합니다. Is it OK to go to the meetings alone? / 모임에 혼자 가도 괜찮나요? No problem! Many people come by themselves and enjoy meeting all kinds of new people. Also, since many people attend the meetings, no one can tell if you came alone or if it’s your first time. Can I bring friends to the meetings? / 모임에 친구들을 데리고 와도 되나요? Sure, you can bring as many friends as you want. 그럼요. 원하시는만큼 다 데리고 오세요. I don’t speak English / Korean very well. Can I still come to the meetings? / 영어를 잘 못하는데요. 그래도 가도 괜찮나요? Of course! Beginners are welcome! Many beginners come to our meetings regularly and have a great time! It’s the only way to improve! Do I need to sign up to attend the meetings? / 모임에 참가하려면 꼭 신청을 해야 하나요?